The samples work with Keurig K-Cup brewing systems. 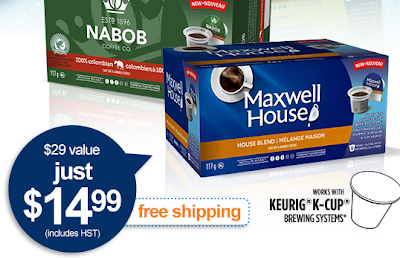 These pods are not compatible with Keurig Vue® or Keurig® 2.0 coffee makers. There is a limit of one KRAFT Samplicious package per household. There is a total of 15,000 sample packages available for shipping in Canada (Quebec included). This offer expires the earlier of December 31, 2014 or when all 15,000 packages have been given away. The products may not be returned or exchanged for any cash value or alternate varieties. Get it today - it's a great value for the money you pay if you are big on coffee!